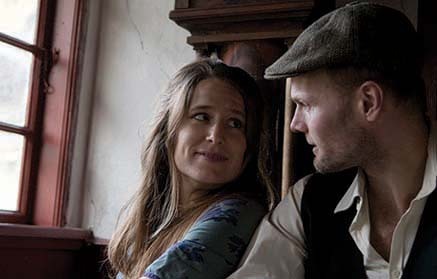 Listening to the playing of Maren Hallberg and Jørgen Dickmeiss makes you sense a close personal relationship between two people converging towards a common destiny. They create an enchanting atmosphere with soul and deep empathy and they perform closely intertwined, as in the traditional dance from which they took the name Svøbsk. The music is a mixture of traditional and contemporary folk music brilliantly played, breathing life into playful pieces with intriguing melodies. 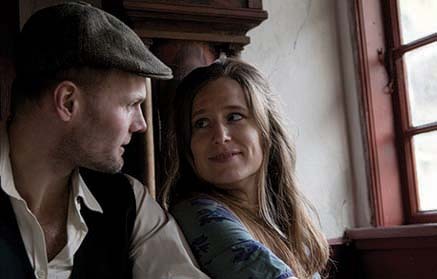 Their bright and articulated music is rooted in the revived legacy of folk traditions from Denmark and its surrounding countries. Hallberg and Dickmeiss have allied themselves with the two great musicians Theis Langlands and Simon Busk and their contributions on piano and percussion complement most beautifully the closely knit musical patchwork of Svøbsk. The musicians draw on a wide range of musical expressions which is united with their deep respect for the Danish tradition. The joy of playing is present and it is clearly to everyone that they inspire each other in their playing. Svøbsk has existed since 2003, when Hallberg and Dickmeiss met each other at the conservatory of Funen, where they both studied at the folkmusic department. As a duo they released their much acclaimed CD Sig mig (“Tell me”) in 2005 which was nominated for a Danish music awards as debut of the year 2006. Their second album En klang af tidløshed (“A sound of timelessness”) – released in 2009 – added piano and percussion to the setup. Svøbsk play a large number of concerts in clubs, festivals, churches and schools every year and have been touring Canada, Greenland, Finland, Iceland, Poland, Scotland and Germany. Svøbsk is the name of a melody – and dancetype, where you turn ’round and ’round in a close embrace until you get all “svøbsked”. Svøbsk is pronounced: swirbsk” – with the “ir” as in bird! Svøbsk is touring as a duo, trio and quartet.